Henri and Paulette Mann, the parents of Jean-Louis, come from several generations (on both sides of the family) of winemakers in Eguisheim and its surrounding villages, making wine under the name "Henri Mann". Jean-Louis met Fabienne, daughter of winemakers in the area as well, and they took the reins from Jean-Louis' parents in 1982. Taking the time to hone their craft, it wasn't until 1998 when they decided to make their first wines under the name "Jean-Louis et Fabienne Mann". Today, their son Sébastien, who has worked in Champagne, Côte Rôtie, Austria, and even Australia, is integrating his way into the family domaine. The Domaine has been certified organic since 2008 and have worked biodynamically since 2009. While already using a very low dose of sulfites for many years, they are about to release their first wine with no added sulfites in 2018! They make wines with the following grapes: Sylvaner, Pinot Gris, Pinot Blanc, Riesling, Gewurztraminer, Muscat, Auxerrois, and Pinot Noir. Jean-Louis says that they treat every wine that they make as if comes from an Alsace Grand Cru vineyard- their yield is small to ensure they are only selecting the best quality grapes, and no additives or chemical products other than sulfites are used in the winemaking process. It is no surprise that even their entry level wines have been mistaken for Grand Crus! 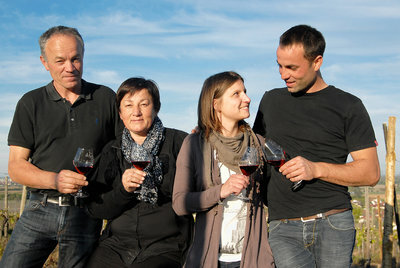 This is the first time that the wines of Jean-Louis and Fabienne have been available in the U.S. in more than a decade!